This review is for the original Angel’s Envy Kentucky Straight bourbon whiskey. You all have heard me gush over Angel’s Envy Bourbon before, but those articles were either covering Angel’s Envy Rye or their cask strength expression. I was so impressed with those two expressions and the team that I met behind them (Wes Henderson and Sons) that I became a fan of the brand. I was also impressed with the fact that this was a local, family owned operation. Their plans for a Louisville Distillery would go a long way in making the city a bourbon destination. Then Wes Henderson sold the company to Bacardi, and we had yet another foreign company in charge of producing America’s Spirit. Some would argue that the team is still involved, nothing has been changed about the mash, and the product is still aged and bottled here in America. To me, that doesn’t take away from the fact that an important part of American heritage has been bought out. Angel’s Envy Bourbon gets its name from the Angels share lost as bourbon barrels mature. Each year, 2 percent or more of the content of each bourbon barrel is lost to evaporation. Distillers call that the ‘Angel’s share’. The brand was launched by Lincoln Henderson and his son Wes under the banner of the Louisville Distilling Company back in 2006. Prior to that, Lincoln spent 40 years at Brown-Forman shaping Woodford Reserve and other notable brands in the company portfolio. 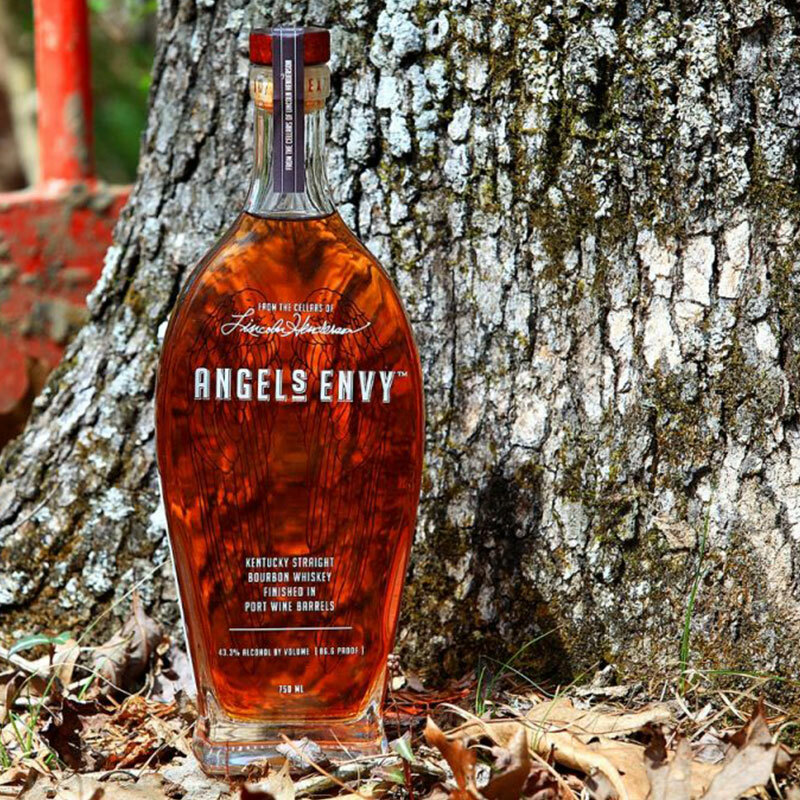 Angel’s Envy became the first bourbon break tradition and be ‘finished’ in port wine barrels. The whiskey still meets all the requirements to be called a bourbon, with the additional finishing giving Angel’s Envy a distinctly different flavor profile. Lets get into a pour, shall we? The first giveaway that this is not an older bourbon is the color. Super light and almost thin. I had my pour in a rocks glass and the nose was elusive at best. You will pick up some light fruit (surprise, surprise) giving away the types of barrels used to finish the bourbon. My guess is these are young tawny barrels, since older Ports can be a little less fruity and a lot more funky. Along with the fruit wafting out of the glass, you will definitely smell the “youth” of the bourbon. I got new wood and young white corn. Nothing that would excite a seasoned bourbon drinker. There is the sweet vanilla and light maple that you would expect from any bourbon, given the aging process, but again – nothing exciting. The first sip is true to nose – cherries up front with a neat floral bloom, subtle sweetness, and then…rye. A surprising amount of rye flavor. The Angel’s Envy mash bill is a traditional 72% corn, 18% rye and 10% malted barley. That 18% there WILL catch you off guard and changes the profile in the middle of the tasting from light cherry to tart cranberry. I didn’t pick up on that until I added a few drops of limestone water. You can do the same or drop a nice fat ice cube in there as well. Another surprise is the char. Whereas I was not turned off by the rye, the char was a little unwelcome. In a bourbon as light as this one, heavy char can dominate the flavor. The char and rye gave the finish a woody, spicy character. Not unpleasant, but not notable as well. Angels Envy is a good bourbon. Not great – just good. Its an interesting change of pace if you have been sipping on an old standby for awhile. New bourbon drinkers will think this stuff is the best thing since cat memes. But if you are thinking about putting this bottle on your shelf, I would think again. We give Angel’s Envy bourbon a C+. Angel’s Envy Bourbon price is around $50 for a fifth. Its an expensive pour by comparison to some much better bourbons out there, and that fact reduced our grade from a B- to a C+. Try this at a bar before you grab the pretty looking bottle. If it rustles your jimmy, then go grab a fifth. If not, I just saved you a few bucks. Learn how we grade bourbon. You obviously don’t know good bourbon or you would never give this bourbon a C+ Grade. its A or A- all day everyday. Please have your taste duds checked because they are out of whack if you believe this is C+ bourbon. I am an avid Angels Envy fan, apparently like you. But I think I can understand the rating here. I enjoy bourbon over Irish whisky & Scotch because of its unique flavors of vanilla & sweetness. I have 2 friends who are definitely scotch aficionados, 1 of whom I’d even call a scotch snob since he only buys small batch bottles directly from distilleries in Scotland. They both consistently rate some of my favorite bourbons pretty low, especially if they have any additional finishing like Angels Envy or Makers Mark 46. Tried it for the first time last night — I don’t get the rave reviews. So light it reminded me of Jim Beam white label. Blaah. For the price of one bottle of Angel’s Envy, I can get two bottles of Buffalo Trace, a far superior bourbon. When you are in the mood for a nice light bourbon this fits the bill. My taste runs from light sippers to barrel strength knock your socks off bourbons. Angel’s Envy is a very good pour for my lighter days.